An impressive collaboration, America Invades: How We've Invaded or been Militarily Involved with almost Every Country on Earth is exceptionally informed and informative. An inherently fascinating read from beginning to end, America Invades is very highly recommended for both community and academic library American History reference collections and supplemental studies lists. 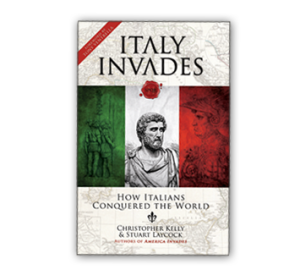 For personal reading lists it should be noted that America Invades is also available in a Kindle edition ($9.99). I'm on my second reading and I still can't put it down. The things that America has been involved with in other countries still amazes me. The book is surprisingly an easy and enjoyable read. I have the attention span of a house cat, and I love history. So sawing into a thick historical manuscript is a challenge for me. America Invades is an ideal combination of historical retrospective, relevant context, and a personable narrative voice. AI has a nice way of stitching together global events with the history of each country. Not only would I recommend AI, I think it should be required reading for voters...AI is "American Foreign Policy History 101" in an easy to read format. Required Reading America Invades is a must-have addition to every school and college librtary. It is an eye-opening revelation of American military involvement in almost every country on earth. Written with concision and wit, it provides a startling picture of American military policies in a dangerous world. “America Invades. A provocative title for sure. Is this an account of American imperial aggression a la Howard Zinn, or perhaps a more neocon examination of historical nation building? Thankfully, nothing like that at all. The subtitle explains perfectly: How We’ve Invaded or Been Militarily Involved with Almost Every Country on Earth. That is completely accurate and leaves nothing out. Books like these almost always veer into political/ideological riffing, and I can happily say that this doesn't happen once in this book. The purpose of America Invades is simple: inform in an entertaining fashion. And my does it succeed. A warning: if the subtitle sounds boring to you, you will probably be bored. Not much to do there. But for the interested, this incredibly accessible book promises to make you look at the world map a bit differently. I read Mr. Laycock’s book first, the British version entitled All the Countries We’ve Ever Invaded (And the Few We Never Got Round To), while abroad in Edinburgh. The title grabbed my attention instantly, being a sucker for trivia and “Did you know” factoids. The emergence of Mr. Kelly’s more relatable (being an American) book was pleasantly surprising, even more so on seeing the collaboration between the two men. Both books are written in a very conversational style; some may be turned off by that approach, but I found it appropriate. This is not a textbook and it does not claim to be; it’s more “popular history.” The book stays light throughout (think wordplay and terrible puns), both in tone and substance, making it easy for those who may have forgotten their world history lessons. I found myself frequently smiling or even laughing out loud as I read about our abundant (and sometimes awkward) international exploits. Another nice, if infrequent, plus about America Invades is that you don’t necessarily have to read it front to back. The book is organized alphabetically by country, so it’s easy to jump ahead and read the section on, say, Kenya, if that’s what you would like to know. The book promises to be a good starting point for research, allowing the reader to make more informed and specific inquiries of more in-depth books. “I had no idea what I had gotten myself into when I began reading this book. And then, I could not put it down. As a former teacher I was impressed with the thoroughness of the approach, which includes maps, an easy to comprehend summary of invasions chart, and an engaging writing style. The breadth of research is amazing, and from A-Z, America's involvement is astounding. From man's first sailing ventures to present day, this book encapsulates America's reach around the globe. If you find informative history books such as At Dawn We Slept to your liking, you will enjoy this book. America Invades should be in schools, in libraries as reference, and on coffee tables, not only as a reminder of where we have been, but as a look at how the US involvement in so many countries, for better or for worse, is a reflection of today's society. "I would have lost the bet. I had no idea that The United States over its history has invaded almost HALF the countries on the globe. That’s an astounding amount of K-rations and munitions and mayhem, however well-intentioned. Authors Laycock and Kelly, with breezy wit and a dogged pursuit of neutrality, deliver a country-by-country compendium of U.S. intervention. Use it as reference; or, read it cover to cover, sea to shining sea, for the adventures and misadventures of American attacks on foreign soil. An eye-opener! A mind-expander! Can an attack of Bhutan or Lichtenstein be far off? One important final note: this book is written with respect for the men and women of the US armed forces." This informative yet entertaining history text presents a factual account of United States military involvement throughout the world. In America Invades, Christopher Kelly and Stuart Laycock delve into all types of US military foreign interaction; everything from territorial acquisition to devastating war to beneficial assistance, even touching lightly on cultural indoctrination. Alphabetically listed, every country the US has ever entered on a battle mission or in an official capacity makes an appearance in this well-researched reference tool. Backed by maps, glossy photographs, charts, a glossary, and an index, the knowledgeable authors provide essential details without overwhelming the narrative with unnecessary repetition or opinionated commentary. The artwork on the cover is misleading, and a visual attack on the senses; its shocking depiction of Uncle Sam grasping a US flag, with warplanes overhead and armed soldiers beneath, looks like a prelude to hard-hitting criticism. It’s not. Anyone but a history aficionado will be astounded at the extent of the United States’ involvement overseas. Packed with expected material pertaining to major conflicts and global wars, as well as a considerable amount of unexpected trivia, the overall impression will vary dramatically depending on political standpoint or national perspective. Since this subject is a hot topic for analysis and debate, information contained in these pages will provoke either sincere admiration or adamant disapproval. In the end, it may boil down to whether a country benefited or suffered as a result of US intervention. Christopher Kelly, a retired television executive with a passion for military history, earned a degree from UC-Berkeley. Stuart Laycock is the author of several history books in the UK, with a diverse background in advertising and marketing, as well as TV. Even an avid history buff will learn something from the book—a little-known tidbit or a frequently ignored fact—making Kelly and Laycock’s work a worthwhile read. The authors’ involvement in television lends an attention-grabbing tone to the writing, steering the content away from academia and toward a mainstream audience. This compilation of data required extensive education, time, and diligence. Regardless of whether an individual approaches the text with a patriotic or non-patriotic viewpoint, no preconceived judgment will detract from the value of the reading experience. In this extensive, whimsical volume, the authors posit what many have long suspected: the United States has invaded or been militarily involved with almost every country on the globe. 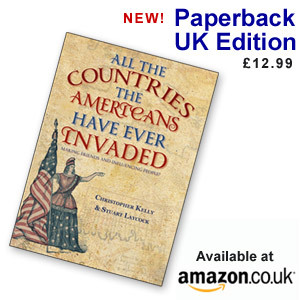 Kelly, a longtime military-history buff, readily admits in his introduction that he drew inspiration for his first book from Laycock’s previous work (All the Countries We Invaded: And a Few We Never Got Round To, 2012), which covers Great Britain’s overseas excursions. The two got to talking and discovered that the US offered even greater fodder for such a compilation. It has invaded 84 out of the 194 countries recognized by the United Nations and has been militarily involved with 191 of those. (The holdouts, the authors note, are Andorra, Bhutan, and Liechtenstein.) Military action is never too far away for America, as Kelly notes: “Americans are always hoping for peace but usually preparing for war. The American Eagle is an ambivalent bird holding arrows in the talons of one foot and an olive branch in the other.” A work such as this has the potential for being academically stodgy, but Kelly and Laycock deftly avoid that trap. Instead, they find colorful, obscure episodes from each country’s past. Take, for example, Panama’s Watermelon War of 1856: “It was really more of a Watermelon Riot, which was triggered by an intoxicated American railroad traveler who took a slice of watermelon from a Panamanian fruit merchant and refused payment. Fifteen Americans were killed in Panama City, and we sent our troops in to restore order.” One drawback is that readers can get cast adrift on the sea of military and political acronyms in the book, but the authors do provide supporting materials, such as a glossary, maps, and a comprehensive index, at the back of the volume to provide perspective for those seeking clarification. Still, for a dedicated history fan, this is an invigorating travelogue, taking readers around the world and backward and forward through time. An intensive compendium of America’s interactions, both good and bad, with other countries that rightly leaves out the philosophizing.